(Photo courtesy of WBZ-TV) Rezwan Ferdaus, 26, was charged with plotting to damage the Pentagon and US Capitol with explosives. Federal authorities today arrested and charged a 26-year-old Ashland man with plotting to damage the Pentagon and US Capitol with a remote-controlled aircraft filled with C-4 plastic explosives. 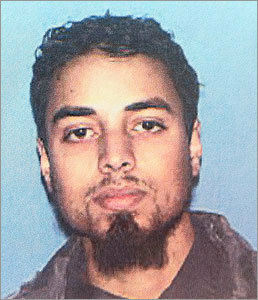 Rezwan Ferdaus, a US citizen, was also charged with attempting to provide material support and resources to a foreign terrorist organization, specifically to Al Qaeda, in order to carry out attacks on US soldiers stationed overseas, the US attorneys office said in a statement. He apppeared for an initial status hearing today in US District Court in Worcester. Prosecutors are seeking that he be detained without bail until his trial. A detention hearing will be held at 3 p.m. Monday. The statement said that the public was never in danger from the explosive devices, which were controlled by undercover FBI employees. Ferdaus also was closely monitored as his alleged plot developed and undercover agents were in frequent contact with him. Federal prosecutors said that Ferdaus, a Northeastern University graduate with a physics degree, began planning to commit violent jihad against the US in early 2010. He allegedly obtained mobile phones and modified them to act as switches for improvised explosive devices, and provided them to FBI undercover agents, believing the devices would be used against US soldiers overseas. Prosecutors said that in a June 2011 meeting, he appeared gratified when he was told that one of his triggers had killed three US soldiers and injured four or five others in Iraq. Thats exactly what I wanted, Ferdaus allegedly said. Ferdaus delivered more of the devices and was anxious each time to know if they had worked and how many Americans had been killed, prosecutors said in a statement. In recorded conversations beginning in January, Ferdaus allegedly also told a cooperating witness that he planned to attack the Pentagon using aircraft similar to small drone airplanes laden with explosives and guded by GPS devies. In April, he allegedly expanded his plans to include attacking the US Capitol. In May and June, he allegedly delivered two thumb drives to agents that contained detailed plans of his proposed attacks. In May, he allegedly traveled to Washington, conducting surveillance and taking photos of targets, as well as his proposed launch site, East Potomac Park. He told an undercover agent after his Washington visit that he wanted to couple his aerial assault with an armed ground attack, involving six people with automatic firearms. Between May and September, prosecutors said, he ordered and acquired materials for his plans, including a remote-controlled aircraft. He also received from undercover agents on Tuesday (what he believed to be) C-4 explosives, six fully-automatic AK-47 assault rifles (machine guns) and grenades, prosecutors said in a statement. Although Ferdaus was presented with multiple opportunities to back out of his plan, including being told that his attack would likely kill women and children .... Ferdaus never wavered in his desire to carry out the attacks, prosecutors said. Glen Johnson and Martin Finucane of the Globe staff contributed to this report.